The Fantastic Four join in as the fires of DoomWar escalate into a fulll-blown inferno! Sometimes you can win every battle and still lose the war. 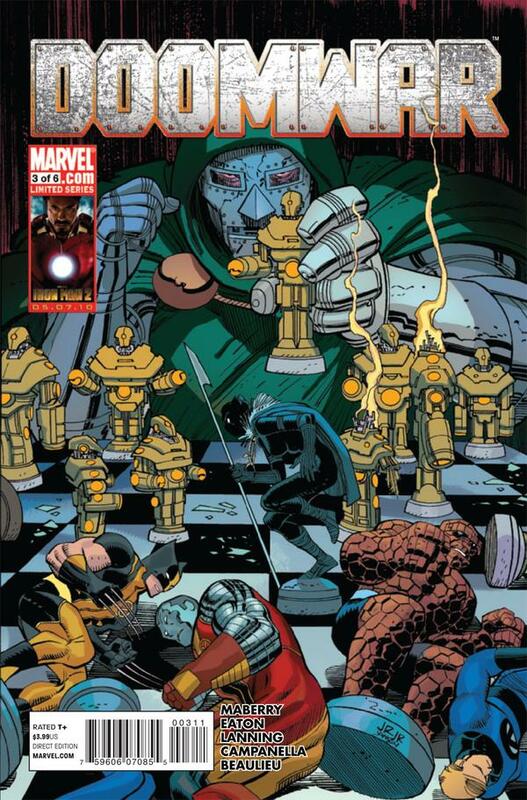 That’s the hard truth facing the Black Panther and the X-Men as they reel from Doctor Doom’s most crippling blow yet. Doom now has everything he requires to become the most powerful force on Earth. All he needs is the time to bring his newly invincible armies into the field. The clock is ticking and Doomsday is coming. We get an overly long recap of recent panther history and the first two issues by way of Shuri trying to get the Fantastic four on board, to help with their Doom problem. The latter half of the story centers around Doom and how he passed the final lock of the wakandan security system “purity”. He enters the plane of Bast the panther God stripped of armor and offers himself up for judgment. 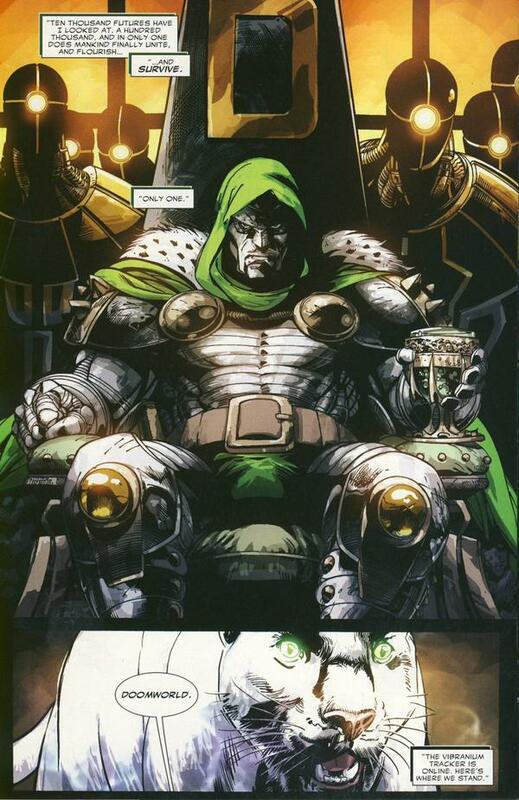 Doom doesn’t try any tricks he does not fight instead he does as the test required he reveals his ultimate truth the very dogma by which he has lived, the real reason for his perceived Villainy. He has seen the future as a sorcerer and thus has seen the world lead to ruin in countless futures, days of future past, skrull conquered world, shiar conquered world, Bishop’s future, galactic avengers etc. What he has found is a single glimmering hope to save the human race a world in which he rules with an iron first. Only here does he see the world surviving and thus his actions are “pure” simply by virtue that he believes it completely. In the end Bast is truly shocked at the purity in Doom’s acts of Villainy. Bast despite being protective of her people has no choice but to cede the Vibranium to Doom for he has passed the test she herself has set. T’challa and Reed track down the Vibranium in many different warehouses owned by doom. They land on the location containing the largest reserve and are my by new Vibranium powered Doombots. Also something you may have over looked….Bast despite giving Doom the vibranium because of his purity in believing that “HIS” future was the only one to lead the world to paradise DID NOT confirm his presumptions, she actually acknowledged she has seen the future as well and the one that leads to paradise BUT she never said that Doom and her vision are of the same world. Interesting indeed……did Doom truly win? Or is Bast using him to fulfill the OTHER possible future she saw? Only time will tell…. The inclusion of the fantastic four works in two ways, for 1) Doom is a major player so it’s only fitting to have his “nemesis” (maybe even sales reasons :P) secondly 2) it ties into their involvement with Shuri in issue 11 and 12 respectively of her Black Panther run. 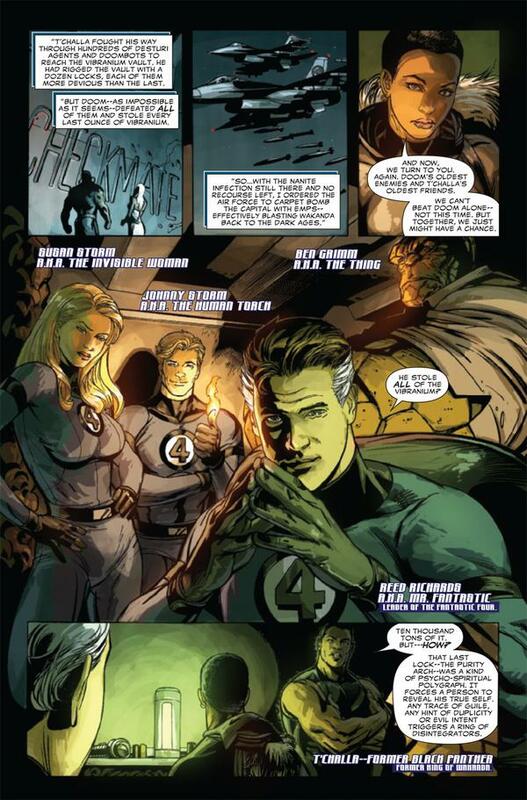 The art work was passable and the fantastic four comes into play next issue. 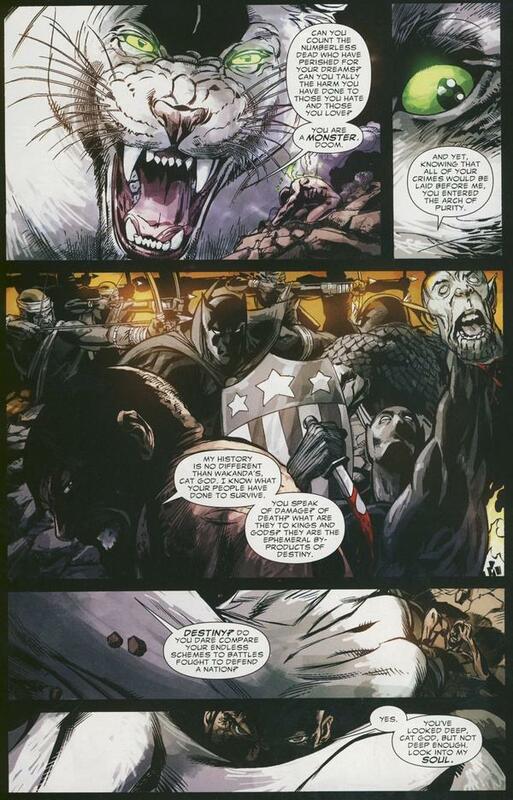 I also loved how the panther verse has expanded organically into the rest of the marvel universe. Marvel has got things right no specific set of characters live in a bubble anymore and for that I salute you! The recap was a bit long and winded and took up more time and space than was necessary. That same long-winded recap served to lengthen the story, that seemed like a cop out. The art is not fulfilling its role here at all, colors are muddy, art work seems sloppy. I’m just thinking how much more awesome would this be IF the damn thing looked as good as it read? Some will have issue with Doom outwitting the Panther God ‘Bast’.